Pressure cookers have come a long way in terms of how they function and what they’re capable of. A few years ago it was a big technological leap just to have a pressure cooker that could work on an induction cooktop, let alone be dishwasher safe. Now pressure cookers can be paired with Bluetooth devices, giving them access to the internet and an unlimited amount of features. This is the best time to own one, especially with the prices being so low for both the modern and traditional versions. Each type has its own advantages and disadvantages, so be aware that modern isn’t always going to be better. A good example is how one Bluetooth enabled pressure cooker on the list only supports Apple devices, leaving a good percentage of Android users out in the cold. Paying attention to these requirements can make sure that you don’t make a purchase that’s useless before it even arrives at your doorstep. There aren’t a lot of accessories included with pressure cookers, so don’t get let down when the only thing included is a recipe booklet and manual. The proof is in the hardware, and a good pressure cooker will show its worth without all of the pizazz of other kitchen appliances. It’s sometimes a thankless job for this single appliance, which in some cases can do the work of 7 appliances. Make your choice wisely from the list and stand by it, as a great pressure cooker not only helps on the health side but also financially. it. Canning is the first thing that comes to mind with a pressure cooker this big, but it is very much suitable for a variety of functions outside of the normal use. If used properly, this can be the best pressure cooker you ever owned in a lifetime, for which it will also last a lifetime as well. They make sure to market that it’s made in the USA, Wisconsin to be exact. They have been around for a long time, and have a proven track record in customer support and product quality. 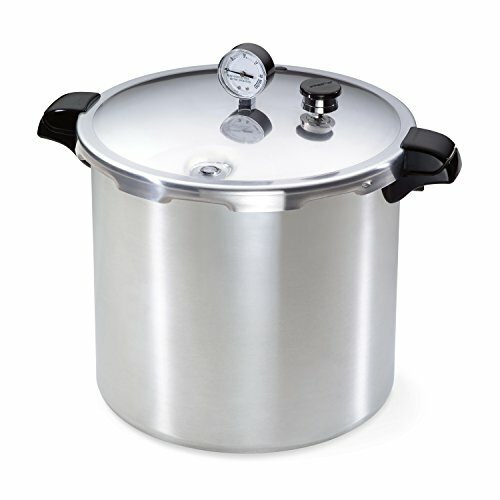 The All American 921 21-1/2-Quart Pressure Cooker/Canner weighs a good 20 pounds, which is a good weight when you factor in how sturdy it remains. If looking for a pressure cooker this is probably going to be the first model you look at, especially if you’re trying to avoid the need for a gasket. This may or may not be a big issue for some buyers that are used to dealing with gaskets on a daily basis, but is a huge selling point for simplicity sake. The height and weight will also come into the equation depending on the type of kitchen you have, and if you plan on moving the cooker more than once you’re going to get a really good workout. It’s strong, roomy, and sturdy for a reason so don’t forget what you’re paying for. If this is a bit too much for you, there are other purchases on the list but they won’t equal the ease, simplicity, or roominess of this model. Second on the list is another high priced model, but one that offers a more up to date take on pressure cooking. With up to four pre-programmed cooking programs on an easy to read digital dial, you’re not only guaranteed the greatest results possible when pressure cooking but it takes a lot of the guesswork out of something that could be complicated. Taking advantage of the two part cooking process, users will also be witness to some of the best textures and flavors possible with a pressure cooker. And for busy cookers there is a timer with an alarm that notifies you when the pressure you want has been reached and released, meaning you can concentrate on other things in the kitchen or around the house rather than hovering around the pressure cooker. The set is fully compatible with induction ranges and has a strong stainless steel base that works with a variety of cooktops without warping. Don’t let the limited 2 year warranty fool you, as the warranty does more than it needs to and ensures your purchase is protected for a long time from damage. A steaming basket is included as a free accessory and adopts the same great quality of the cooker. The pressure isn’t enough to use it for canning, so be aware that this item will not work well for you in that situation. This was made from the ground up to be a modern pressure cooker, and completely exceeds expectations when it comes to that. The digital functions on it are very easy to use, even for the technically challenged users. A clear and easy to read plus and minus button are in plain view, and the beauty of the cooker is that these are optional features that have no bearing on using the pressure cooker in a manual state at all. You’ll enjoy using this at family gatherings where you have a million things going on at once and can’t afford to pay attention to just the pressure cooker-on the strength of that alone, it pays for itself. It is disappointing that the pressure is not high enough to can, as that would have been a killer feature that made this the undisputed best on the list. The included cookbook contains directions and illustrations to get you started with basic recipes and more advanced recipes. This is a very nice purchase for anyone considering it, and will leave you with very little regret when it comes to spending the money. The first low priced option on the list is the Presto 01781 23-Quart Pressure Canner and Cooker that is more of a throwback to the old-school style way of canning. This hybrid canner and cooker can function as a large capacity pressure cooker for your various meats or vegetables, or use the boiling-water canner method for preserving various fruits, jams and sauces. There really is no limit to what you can do with this unit, just as long as you have a recipe available. Presto went through great lengths in making sure that you can use this on multiple ranges, whether they’re the regular gas and electric or the induction. The heavy gauge aluminum used to construct the cooker is war resistant and extra heavy, which is why they felt so confident in providing an extra-long 12 year limited warranty. If something does go wrong you will not only be covered but will get great customer support for over a decade. The unit uses a standard pressure dial gauge which gives you the most accurate pressure possible, especially at higher altitudes where it becomes even more vital to get it correct. This is one of the largest cookers on the list, and as such it keeps you quite busy with the 76 page instruction and recipe book. Included accessories are a canning and cooking rack ideal for the simplest solutions for beginners and expert solutions for advanced users. Although it doesn’t have the range of features of the first two cookers, it is still simple enough if the directions are being followed correctly. A good safety feature that is built into it prevents the cover from being opened until the pressure is reduced to a safe level. The cover also won’t build up pressure if the lid isn’t closed properly, which will prevents a lot of first time mistakes from happening. Considering the weight of the first pressure cooker on the list, this one has it beat by only being 10 pounds total. It’s a lot easier to handle for people that plan on using it often for canning and filling it up to the fullest capacity. At half the weight you’re not missing too much in terms of depth, and can still do just as much with this cooker as the first. The capacity is 7 quarts when using as a canner, so use with care and don’t overfill. Although not as advanced in features as the first few cookers, this is still a viable option and very much one of the better cookers on the list. 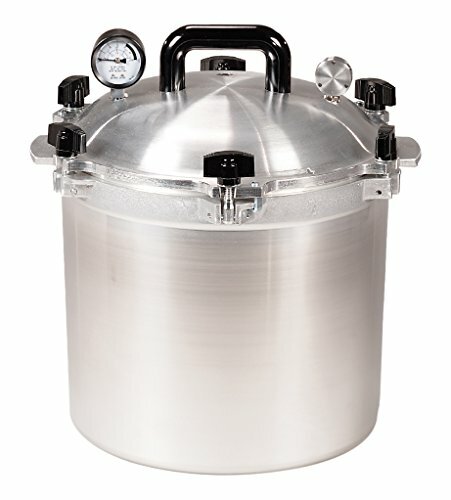 At the mid-price point is one of the most incredible deals on the list if you’re not looking for a canner. 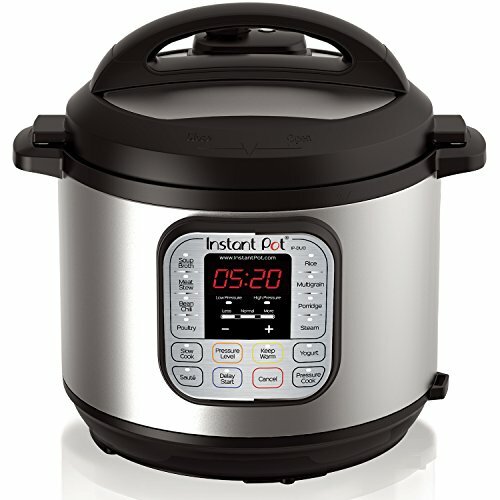 This Instant Pot is a modern take on pressure cooking, and can be used as a pressure cooker, rice cooker, yogurt maker (something for the smoothie lovers out there to consider), steamer, warmer, and even for sautéing or browning. On top of its multifunctional use it also is easy to use, with the large easy to read control panel that has 14 built in programs. The pot can also auto default to keep itself warm after it’s done cooking, and just like a normal slow cooker it has 3 temperatures for sautéing and slow cooking. A unique feature of the cooker is that it has dual pressure, but be warned that for new users it will take a little getting used to this advanced feature. If safety is a concern then this is the one to purchase, as it is UL and ULC certified and has managed to cram in over 10 safety mechanisms while still being energy efficient. It has also been getting some great reviews (see here) and most people that buy it are happy with it. Pot materials are a 3 ply bottom stainless steel that will work on most cooking tops without worries about warping, but in the long run it would have been preferable to use a higher grade steel. There are high grade accessories to use like the stainless steel steam rack with handles, and the recipe/manual that is a must for understanding all of the great features of this pressure cooker. The pot is on the smallish side when compared to the others on the list, and at 6 quarts may be a bit too small for some user’s tastes. Filling over the max line is not recommended, but can have some adverse effects to the actual cookware due to the outer rim not being made of stainless steel nor coated. Despite its low fill size and small stature it weighs a heavy 12 pounds, which is interesting when you compare it to some of the others on the list. For those interested this is a Canadian product, by a reputable and well known company that has been in the business for years. If looking for a modern take on pressure cooking, then this is the best one on the list you can buy. With the price, features, and safety mechanisms it stands out as a top one on the list. 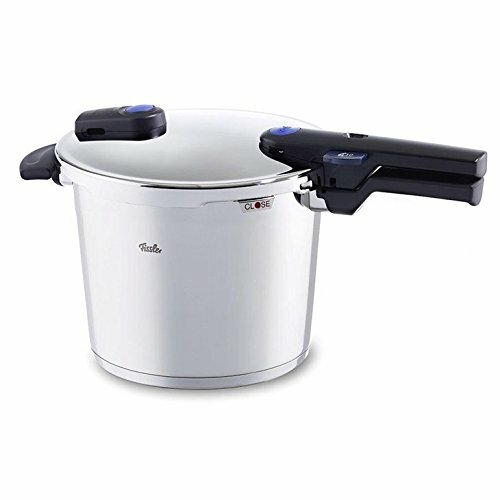 As a low priced option for users that just want the basics of pressure cooking, this small 6.3 quart cooker actually works well on many levels. It features a one hand system that allows you to both open and close it with ease. This feature works just as good as advertised, and will benefit many users that only have use of one hand in their everyday life. During cooking you can use the variable steam release valve, setting it to whatever you feel comfortable with while the pressure process takes place. The base is built from stainless steel so that it evenly distributes heat, while also maintaining full functionality across all modern cooktops. Not only is the unit small and portable but it only weighs 7.7 pounds, making it one of the lightest on the list by far. 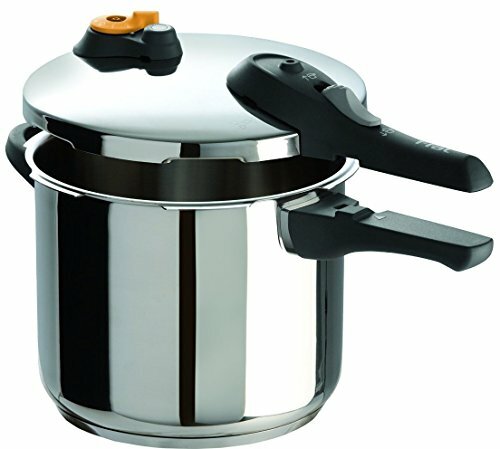 In situations where you have to cook something and bring it directly to a party, this would be the ideal size and type of pressure cooker you would want to purchase. They didn’t skimp on the extras, and inside the box is a steam basket and thick recipe book ready for you to try out. The handles on the side of the unit are riveted and built for portability, and minus the gasket and pressure valve the unit is dishwasher safe right out of the box. There are a lot of units on the list that are not dishwasher safe, so adding to how portable this unit is along with the one handed features makes it a great buy overall. Extra safety was put into place and the manufacturer made it so that the cooker will not open while in use and under pressure. Surprisingly this is a really good deal for those looking for a light portable pressure cooker that isn’t cheaply made. T-fal has been in the business for over 60 years and their customer support is top notch in the industry. If you’re tired of a pressure cooking system that makes you line up the lid and the pot then this will be the best purchase you ever made. Not only is it easy to get set up, but it has just enough features to make it usable by people with different wants and needs in a pressure cooker. Purchasing this will not only be a wise decision, but a recommended one. 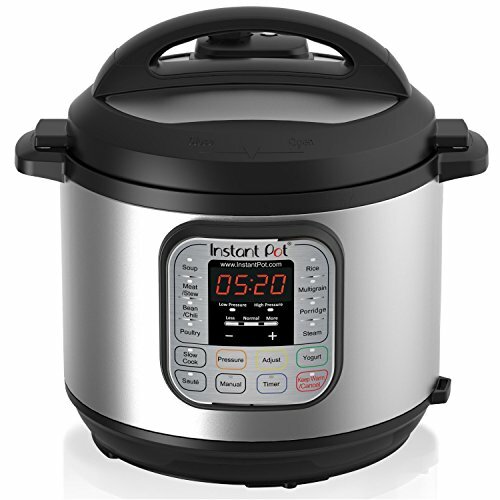 Another low priced option on the list is this Instant Pot that has multiple uses as a pressure cooker, slow cooker, rice cooker, sauté and browning as well as steamer and warmer. It’s another on this list that works well as a multifunctional jack of all trades but master of none machine. Adopting the modern take on pressure cooking users will be enamored with the large control panel that can be a bit daunting at first glance. It comes with 10 built in programs allowing for instant settings for soup, poultry, meat/stew, bean/chili, sauté, rice, multigrain, congee, steam and slow cooker. For those worried about safety it’s UL and ULC certified and is made to last for years. For manual settings you can rest assured it’s just as easy as the automatic timers, and even has a setting for a delay cooking timer with automatic keep warm function. This is another one of the smaller pots on the list, and only sports 5 quarts for you to play around with. The foundation is solid, and is built from 3 ply stainless steel while including an equally solid stainless steel steaming rack. 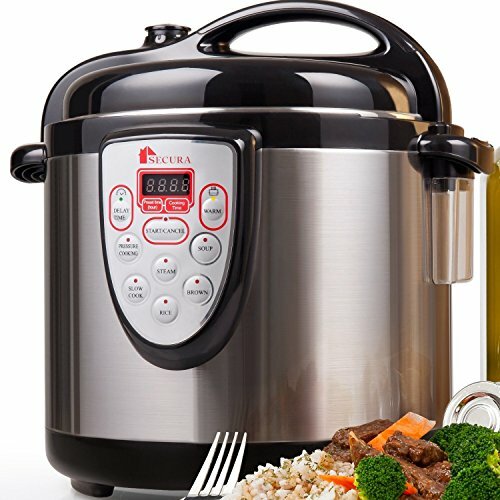 This is another Canadian pressure cooker that is quite popular worldwide due to its great customer satisfaction and quality. Cooking speed is enhanced up to 2-6 while using up to 70% less energy, which should make green consumers very interested as buyers. Once again the control panel is something that may scare away the average consumer, even though it was made with them in mind. It’s very easy to operate even without glancing at the manual. The auto settings on the front of the panel not only make using it a breeze, but it also simplifies some of the more complex recipes that are available for pressure cookers. With the auto warm function there is a danger of burning the food at the bottom, but it’s not as likely as some may suggest. Just using simple precautions as described in the manual will overcome this problem if it should arise in the future. The manual will be your best friend, as well as the recipe book which is one of the better ones on the list. Not only is it up to date, but a lot of it is specific to this pressure cooker. This is one of the tops on the list, which is surprising considering multi-function pressure cookers are usually hit or miss. Now this is where things get really interesting, with one of the highest priced items on the list with this innovative Zojirushi. As a 1 liter model, it works well for cooking white rice, sushi/sweet rice, mixed rice, porridge, brown rice, GABA brown and even regular pressure cooking recipes. The product is geared toward rice preparation but it’s important to note that it excels in other areas as well. Soaking and steaming time is handled by the Umami setting that helps you to get excellent rice every time. Another part of the multiple settings is the ability to reduce steam by 50 percent, which is a marvelous attribute for certain vegetables and rice to come out correctly. For those special dishes that require crispy rice, you can easily one push the scorch setting to toast the rice to perfection. You wouldn’t call the LCD panel on this unit the best on the list, because it has so many functions. Technically speaking it is the best, but is very much a big step up for the regular user that is used to normal pressure cookers. This unit has a must read manual that will prevent you from ruining future dishes. The company makes claim that the built in AI learns how to cook the perfect rice based on the results it collects from how you cook. It works really well, and is a very interesting function for people that cook the same thing repeatedly throughout the month. The inner cooking pan is platinum infused, which is the best inner pot quality of any on the list for cooking. Not only is it non-stick, but it has the ability to change the water quality so that the rice can absorb the water. Safety is also top notch with a pressure control valve, back-up safety valve and a pressure indicator on the control panel. This is the most advanced unit on the list by far, even if it focuses on being geared more towards making rice than other dishes. With some reading and research you’ll easily unlock some of the hidden features of this gem and realize its full potential. Even with a steep learning curve and small size, this is very much worth looking into as a pressure cooker. Keep in mind this is on the smaller side, and it has some personal quirks you will have to overcome. Make the purchase if you want something that will wow your guests and last you for years. Material: Stainless Steel Skirt - Anova has a removable, stainless steel skirt that can be cleaned in the dishwasher. 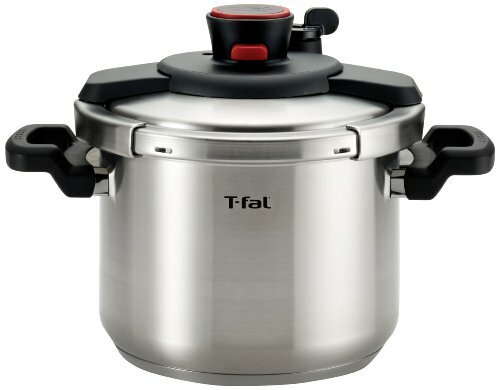 T-fal makes another appearance on the list with the P25107, one of the lowest priced pressure cookers you can purchase that is still of good quality. This 6.3 quart cooker works on all surfaces, including the much loved induction cooktop and even has an over pressure gasket release window. Pressure cooking is a lot easier with its simplistic features, and there is nothing about this unit that requires a steep learning curve. You get a clear view of the current pressure and can even use the variable control operating valve to raise or lower it. The safety functions are just as basic, protecting the opening and closing of the lid so that you don’t get hurt during the process. Traditional is the big word here, as this doesn’t break any new ground and is your basic pressure cooker without all of the bells and whistles. The stainless steel construction isn’t basic, and will surprise you with how durable it is when you compare it to the low price. Along with durable steel is even heat distribution due to the multi-layer base that they include. Accessories included are a steam basket and stand, so nothing too spectacular on that front, but enough to get you started. The variable control valve is easy enough to use, but be away it only allows the two settings of 10 or 10 PSI, so you’re really limited in what you want to do. For 6.3 ounces available to use, the entire unit weighs less than 9 pounds, so it’s portable if you were looking at it as such. 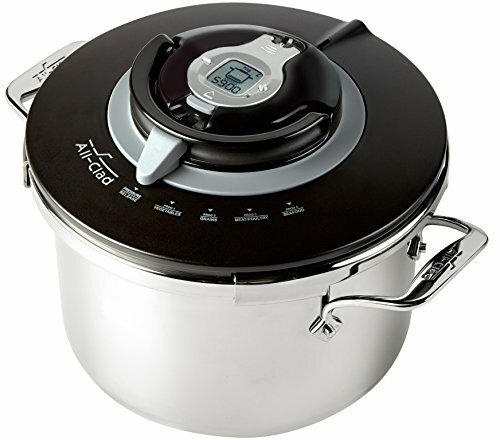 This is a great choice for beginner pressure cookers, since they will be missing out on more of the advanced features. But the size is big enough to where you can throw an entire chicken in there and roast it, so even if you’re lacking for features you’re not lacking for space at all. The options are so few that users won’t mess up their meal while fiddling with unknown buttons due to inexperience. But that also is a double edged sword, since a lot of those premium features like auto-warm would benefit new pressure cooker owners. This is not on the top of the list, but it’s very much a good option for someone that just wants to throw something together and get it done without getting a PhD in pressure cooking. 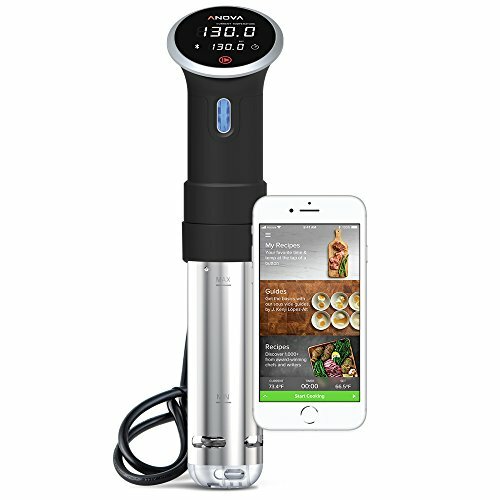 The award for the most innovative item on the list goes to the Anova Culinary Precision Cooker, a high priced device that can pair with your smartphone in order to give you the perfect results every time. The entire setup is easy to use, and the included clamp can be adjusted to fit any tank or pot that you have. The stainless steel skirt is dishwasher safe, and can be removed in order to clean it multiple times. The best feature is obviously how it can connect to your smartphone, and using the app you can both cook and monitor your food remotely. It’s one of those options that you will use if you buy this, as that is the prime feature of the device. Push notifications can be enabled by default, letting you get pop ups whenever the device is brought up to temperature, finished or preheating. This may seem like a lot to take in from such a small lightweight device, but if used as a single or even as a group it is a real revolutionary way of steam cooking that should not go unnoticed. There is a bit of trial and error to cooking with the Anova Culinary Precision Cooker, due to the directions being wholly different that cooking with a regular pressure cooker. The default setup is that you attach the cooker to your pot with your food in a Ziploc bag and let the cooker do the rest. It’ll control the water in the pot and maintain a consistent temperature, while also cooking the food in its own juices so it’s moist, tender and flavorful. The idea of setting a timer and forgetting it really comes into play with this device, especially with the notifications that can be sent to your smartphone. Since the app connects to an entire database you not only have the option of manual cooking but can simply search for what you want to cook and press a button. There isn’t anything else on the list like this product, and it’s truly in a league of its own. An android or apple device is needed to use the app, so Windows phone and Blackberry users will be out of luck. Considering the price and size, this is one of the top pressure cookers on the list and one to watch out for. The FisslerVitaquick Pressure Cooker is a high-priced option that won’t beat you over the head with modern features, but rather give a traditional approach that perfects the more important features of pressure cooking. Vitaquick prides itself on having a line of pressure cookers that are completely steam free and silent. For users of their other products then there is also the option of stacking them on top of each other, as well as any pot with a conical shape and of the same diameter. When cleaning the main control valve it is a simple process of moving the lid under running water. And one of the more overlooked features is the internal measuring scale so that you know exactly where you stand in your current session of cooking. Everything on this unit just screams quality and just works, without any of the overcomplicated features. Even the safety feature of putting on the lid is as simple as waiting for it to click into place so you know it’s locked. There are other traditional and easy pressure cookers on the list, but this is one of the few that also has a premium quality to match it. Germany makes awesome things and you can count this pressure cooker as one of them. The simplicity of the unit is enough for it to be perfect for newcomers, but also has enough of a high-quality touch to make it ideal for expert purists that want the best of the best. A lifetime warranty is included so you don’t have to worry about paying a fortune for a product that won’t last you a year. For the design it’s nothing breathtaking, but it’s so sleek and clean looking that you may be jealous when you put it side by side with your other kitchen appliances. With an available 6.3 quarts at your disposal, it’s amazing that the unit only weighs 4 pounds. It’s an incredible weight considering that other 6.3 pressure cookers easily go over the 10 pound mark. You’re not missing anything important without the extra missing weight, and everything you need is included in the package. Not only will you be able to cook faster and more efficiently with this model, but you won’t feel like it has to hold your hands while doing so. Easily in the top 3 on this list, you can’t go wrong with this purchase as a beginner or as an advanced user. Low priced and affordable, this brand named Cuisinart is a model you’re likely to run into when going to a brick and mortar store like Wal-Mart. Cooking time is reduced by 70% due to the new technology introduced in this 6 quart cooker. A digital control panel with easy to read buttons makes cooking easy whether you’re using the one push cook method, manual method or checking the digital thermostat while adjusting settings. Out of all the digital options on the list, this one pretty much nails it in terms of simplicity since it doesn’t overwhelm you with options. Even the settings for browning, simmering, sautéing, warming and pressure cooking are not only easy to find but a no brainer to manage. The non-stick pot and trivet are dishwasher safe and easy set up and break down. The brushed stainless steel is prettier than it is functional in some cases, as some users may find out when preparing multi-dishes. Locking the lid can be a bit of a pain, as it employs the traditional seal and lock method rather than the more modern methods discussed on this list. Make sure to release the pressure once the cooking to prevent overcooking of your food, which this model is notorious for. There is also a chance you can damage the gasket if you store the pressure cooker with the lid on tightly. This is something that is not a problem with others on the list, so it’s a bit curious that it could damage this model when stored. There are some guides and samples to get you started, but there was definitely something missing as far as how to get the most out of the cooker. A lot of it was copy and paste information that didn’t apply to the cooker itself, and involved the user to do calculations on their own to get the measurements right. Out of all the models on the list that could have benefitted from a better recipe book, this would be the main one. At 6 quarts of capable food the entire unit weighs in at 14 pounds, so it’s a bit of a beast even without being of premium quality in parts. 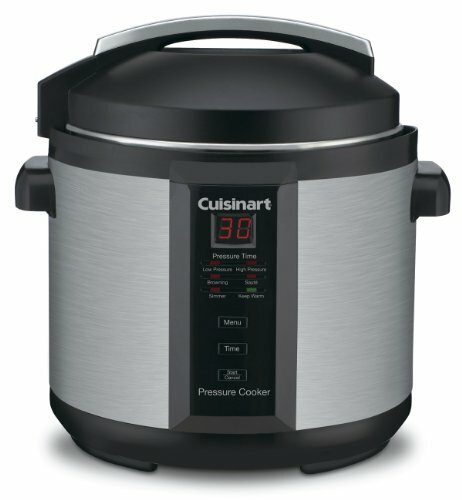 This is an okay pressure cooker that borders on average, and its ease of use will appeal to beginners that just want a decent pressure cooker. Another one of the advanced pressure cookers on the list is this high priced Instant Pot that has Bluetooth functionality. 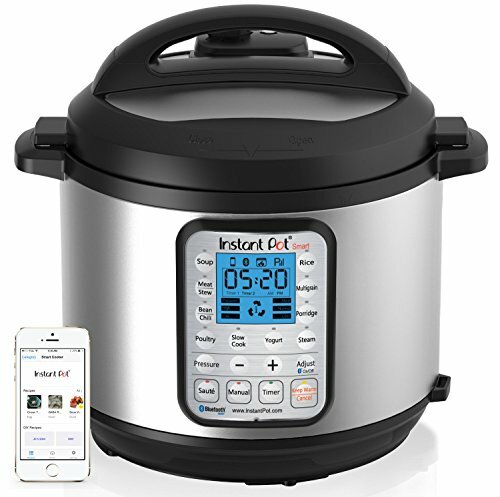 Whereas the Anova Culinary Precision Cooker had an app available for both IOS and Android, the Instant Pot unfortunately is only supported by IOS. An Android version is coming soon, but without the support for the app right off of the bat, it deters a lot of users from making the purchase. Using the free IOS app you can monitor and program your cooking with incredible ease, with an option to purchase the premium version of the app and then adding other recipe apps. Upgrading from the free version to the premium version is completely optional, but recommended considering the feature list more than doubles when you do so. There are 14 built in programs with the option for automatic keep warm and dual pressure. For safety seekers it’s UI and ULC certified with up to 10 safety mechanism, while still maintaining a favorable energy rate that makes it just as energy efficient as any of the other cookers on the list. The steam rack is made of stainless steel and comes with a handle, and some of the more fun accessories that are included would be the silicone mini mitts and default recipe and manual booklets. Adding in silicone mini mitts was a fun choice and will definitely appeal to some users. Besides being able to load recipes on your app and send it directly to the cooker, you can share them with friends. The technological portion of the steamer is impressive, but that doesn’t discount the actual pressure cooking of the unit which is outstanding. It can make mashed potatoes in 15 minutes, requiring a lot less energy and time than doing it through a pot and water. With the help of the app you can simply load in the listed ingredients, press a button on your phone and then walk away. You’ll have a complete meal in under an hour, with little clean up to worry about since it’s all done in one pot. Missing Android functionality is a big minus, but if they follow through with making an app for the market then all will be forgiving. If you happen to own an Apple device then this is a can’t miss steamer that will leave all of your friends jealous. Last on the list is this 6 quart low priced pressure cooker from Secura, which is a perfect mix of modern and traditional pressure cooking styles. You can use it as a food steamer, rice cooker, slow cooker, fish and salmon, browning/sauté pan, and even soup maker in addition to the slow cooking function. It features the default keep warm feature that not only works well for keeping the food warm, but doesn’t scorch the food from the bottom like some other models are known for. Its stainless steel base makes the pot ideal for dishwashing, while the stainless steel lid is not only easy to program but also to clean by hand. Energy efficiency won’t be a problem with this model as it is very green friendly. Temperature is managed with the built in microchip, and even with using the time control system you’ll learn that setting it is a piece of cake. For users that are have a lot of things on at once, the 24 hour delay timer is a big feature that will get a lot of use during the holidays. By using the big digital control panel, everything with this unit becomes second nature to control. They didn’t go crazy with the accessories, but still managed to include a nice rice spoon, measuring cup, steel steam basket, steam rack and recipe book and user’s manual. The entire unit comes in at 12 pounds, so it isn’t too heft and manages to hit that sweet spot with pressure cookers in its range. Where it falls short is that the pressure isn’t ideal if you’re looking for anything above 11 PSI. This is a small little complaint in the grand scheme of things, as a little PSI here and there would be reserved for the perfectionists in the cooking arena. But they do exist, and having such a low cap on the PSI can prevent a potential purchase from occurring. The safety that is in place can also be an annoyance when you think you have the lid on correctly, but it keeps randomly turning the food to warm as a safety measure. Although the lid locking can be a pain in the beginning, once you get it down it shouldn’t be a factor for the years you will own the product. The last item on the list is pretty good, but not great. It’s a worthwhile purchase for users that are looking for something to replace their old pressure cooker that has gone bad. Pressure cookers are known more for how they lock in flavor and get the most out of the ingredients you put in. But there is a hidden nutritional side to pressure cooking that isn’t mentioned quite enough. Along with the extra flavor that comes with pressure cooker, foods also retain more nutrients when they’re prepared this way. Usually when preparing on a stovetop extra liquids are required to keep the food moist and tasty. Using a pressure cooker you not only require use of less liquid, but what is in their basically cooks within itself. If you purchase a pressure cooker with canning abilities, then you get the best of the best with the ability to store food for future use. If you do a lot of gardening or consider yourself an avid hunter then this feature alone will be worth the health benefits. Besides being able to store food which retains its nutrients for long period of times, you also get involved in the world of preservation which is a very deep and involving hobby. If you prep grains and legumes in the pressure cooker it will reduce phytic acid and lectins by up to half, sometimes even more. This is important as these types of chemicals in our body often prevent us from properly getting the most energy and nutrients out of our food when it’s breaking them down. On the flipside food that often introduces other harmful chemicals to the body due to their cooking time when they’re dry reap the most benefits when they’re cooked in a pressure cooker. In a pressure cooker since the food is done a lot more quickly you receive extra benefits, even more so since it can prevent carcinogens in your food from forming that is usually a process of dry cooking methods. 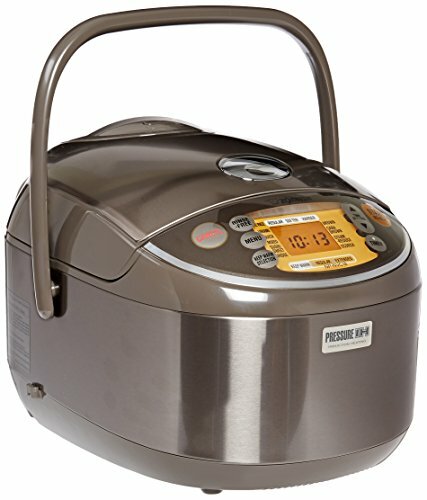 Pressure cookers are incredibly versatile, and will continue to catch on as people realize their great health benefits. You may have 20-30 kitchen appliances that you don’t use, but if you buy a pressure cooker it will more than likely be used every week. Even an average pressure cooker will last you for years, so why not choose the best pressure cooker? Whether you choose to go the traditional or the modern route, the best pressure cooker will last you a good lifetime.